Last week I was in Florida on business. Naturally, I planned to visit some Gulf Coast Lighthouses on my off days. On the flight from Seattle I received a positive omen when the flight attendant handed me one of those tiny bags of airline pretzels. 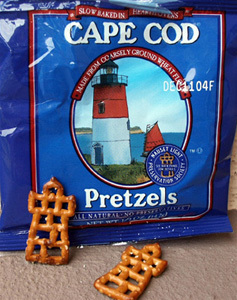 Lo and behold, this bag was emblazoned with a photo of Nauset Lighthouse and even had pretzels shaped like lighthouses! I thought this might be worth a chuckle. My second day on the Panhandle I had the honor of dining with "The Lighthouse People," Sandra and Bob Shanklin, near their home in Fort Walton. It was a pleasure to finally meet and swap great stories with the couple that have truly helped fuel my passion for lighthousing the last few years. On June 24, I chartered a boat out to Cape St. George and took some great photos. The lighthouse foundation is almost completely submerged in the high tide but continues to stand straight and true. The brick chimney is all that remains of the keepers house. Photographing this lighthouse while all alone on the island during sunset is one of my all-time LH highlights. However, I left there rather melancholic realizing these may be some of the last photos ever taken of this light. Let's hope mankind can reach some sort of agreement with Mother Nature and take definitive measures to preserve this light before the sea brings her down.